Your Choice of Campero Fried or Citrus Grilled Chicken. Includes Two Choices of Side and Your Choice of Dinner Roll or Tortilla. 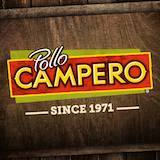 Choice of Campero Fried, Grilled or Both (Fried & Grilled). Includes 4 Pieces of Chicken, 2 Classic Sides and Choice of Tortilla or Dinner Roll. Handmade Daily and Packed with Our Signature Chicken. Includes Choice of Side and Choice of Drink. Your Choice of Campero Fried or Grilled Chicken. Includes 4 Classic Family Sides and Your Choice of Tortillas or Dinner Rolls. Your Choice of Campero Fried or Grilled Chicken. Includes 2 Classic Family Sides and Your Choice of Tortillas or Dinner Rolls. Your Choice of Campero Fried or Grilled Chicken. Includes 3 Classic Family Sides and Your Choice of Tortillas or Dinner Rolls. Slowly Cooked Pinto Beans. Made with Chorizo, Onions, Garlic, Diced Tomato, Cilantro and Jalapeños. 100% Natural and Refreshing. Choice of Horchata or Mango. Includes 3 Camperitos (Boneless Wings), One Side, One Apple Mango GoGo Squeeze, and Choice of Drink. Includes Choice of Fried or Grilled Drumstick, One Side, One Apple Mango GoGo Squeeze, and Choice of Drink.